Legendary gangster and notorious bank robber John Dillinger, America's first "Public Enemy No. 1," was shot to death by federal agents in an alley near the Biograph Theater in Chicago on July 22, 1934. Two days later, two young men walked into a small café in Los Angeles, robbed the proprietor at gunpoint and, as they were backing out the door, announced that they were "the new Dillingers, and we're plenty tough." 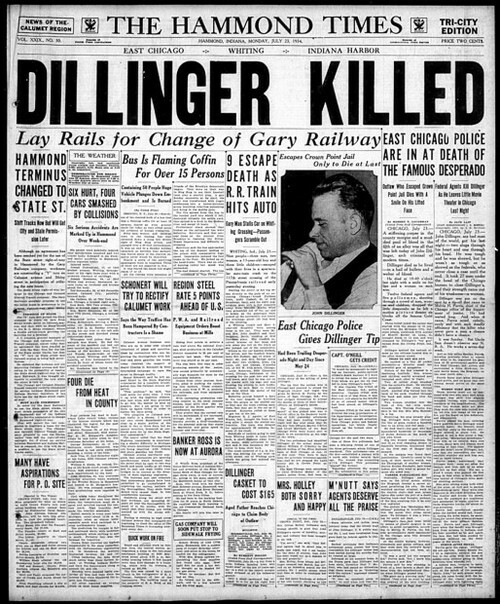 Unlike Dillinger, however, their brief crime spree ended a few hours later when they were both arrested, but not before one of them shot and killed an LAPD officer. Russell Arthur DeSilva was born on July 28, 1898, in rural Jacksonville, Illinois, about 25 miles west of Springfield. His parents were Arthur and Louise Smith DeSilva, and his younger brother, Willard, was born the following year. Arthur and Louise were both the children of immigrants from the Portuguese island of Madeira. By 1900, however, Louise and her two young boys were living with her parents, Joseph and Andrizza Smith, although it isn't known if Arthur and Louise divorced or if Arthur died. 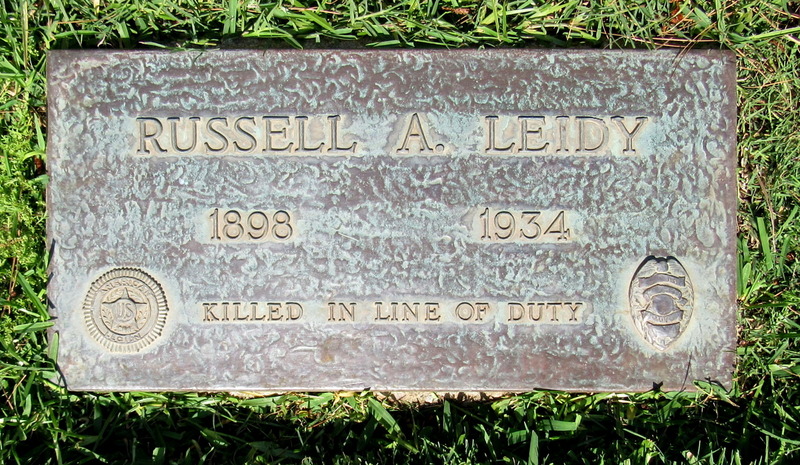 A few years later, Louise married Charles Leidy, and her two sons, Russell and Willard, took their step-father’s last name. The couple also had two more children -- Donald, born in 1904, and Andrizza, born in 1905 and named after her grandmother. In about 1919, Russell Leidy married Lillian May Fernandes, and was working as a bricklayer in Jacksonville, making bakery ovens. Their first child, Charles William, was born in 1920, and their second child, Lydia Louise, was born in 1921. 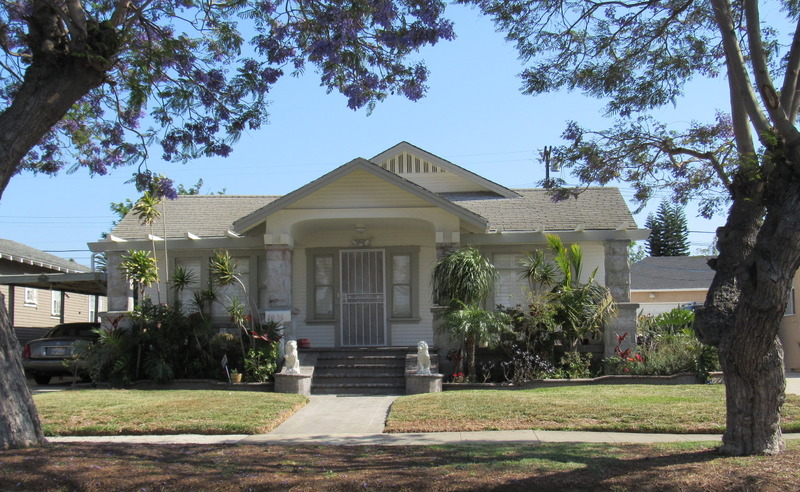 Leidy worked briefly for the fire department in Jacksonville before the family moved to Southern California in about 1925, settling in Inglewood, where Leidy found work as a bookbinder. In 1928, Leidy joined the LAPD and, in 1931, the couple's third child, Joan Lucille, was born. On Tuesday evening, July 24, 1934, Leidy and his partner, Officer Ohen H. Tucker, were patrolling south Los Angeles in a radio car when they were notified that two armed men had just robbed a café and sped away from the scene on South San Pedro Street, not far from their location. The two robbers, both in their 20s, started their evening at a café at 5800 South Broadway. After sitting briefly at the counter, one of the men displayed a handgun, announced a robbery and took $5 from the proprietor, Henry E. Ramirez. Next, the two men went to a café about two miles away run by Harold Smith at 3316 S. San Pedro St., where one of them pointed a gun at Smith and a customer, Merle Parmele. After taking an unknown amount of money, the two men backed out the door of the café, with one of the robbers warning Smith and Parmele not to "start anything," adding, "We're the new Dillingers, and we're plenty tough." But the boastful robbers didn't know that Parmele was an off-duty LAPD officer. He drew his gun and ran after them, reaching the street just as they jumped into their coupe and headed north on San Pedro Street. Parmele and an LAPD sergeant who happened to be in the area fired several shots at the fleeing car and the robbers fired back, but all of the shots missed their targets. The robbers turned right onto 33rd Street, but their car slammed against a curb. They noticed a man nearby parking his car in an alley, so they ran up to him, and ordered him at gunpoint into the front passenger seat of his car. One of the robbers got behind the wheel, the other climbed into the back seat, and they sped off. After Officers Leidy and Tucker heard the report of the fleeing robbers, they saw the car speeding along 33rd Street, and forced it to the curb at the corner of 33rd and Stanford Avenue. As Tucker approached the driver's side of the vehicle, Leidy went around to the passenger's side, and spoke to the man sitting in the back seat. The man responded by raising his gun and shooting, hitting Leidy three times. He died at the scene. Tucker emptied his gun at the car as it sped away and the man in the back seat returned fire. The car's owner, John Myers, who had been hit twice in the crossfire, jumped out of the moving vehicle onto the pavement, and quickly begged the officer not to shoot him again. The two men were both charged with murder, kidnapping, robbery, and assault with a deadly weapon with intent to commit murder, with prosecutors planning to seek the death penalty. The man in the back seat of the car quickly admitted that he shot Leidy and that the entire crime spree was his idea, while the other man said he didn't realize that they were going to rob the first café on South Broadway until his partner passed the gun to him under the counter. The two men had only known each other a few weeks before their brief crime spree. They met when they worked together on the docks as longshoremen. As the two men were indicted, Leidy's body lay in state in the rotunda of the Los Angeles City Hall. His funeral services were conducted on July 26 -- two days before what would have been the officer's 36th birthday -- and he was buried at Inglewood Park Cemetery, less than two blocks from where the family lived on West 74th Street. Leidy left his widow, their 14-year-old son, and two daughters, ages 13 and 3. A month after her husband's murder, Lillian Leidy, 33, was awarded a pension of $150 per month by the Los Angeles Pension Commission, to support herself and her three children. Following a jury trial, the 20-year-old shooter was found guilty of murder and two counts of robbery, but was acquitted on the other charges. He was sentenced to life in prison on the murder charge, and five years to life on each of the robbery charges. "The evidence in this case shows this defendant guilty of the murder of Officer Leidy," said L.A. Superior Court Judge Benjamin Rey Schauer, the presiding judge who later served for 23 years on the California Supreme Court. "And in the attempt to escape after the first two robberies, the defendant engaged in a gun duel with no less than four police officers. He killed one of them. He did not kill the others, only because he could not hit them." Schauer recommended to the State Prison Board that Leidy's killer serve a life sentence for each charge, to be served consecutively, "and that the prisoner never be granted parole." Despite that strong recommendation, the shooter was granted parole on Sept. 8, 1952, after serving 18 years at San Quentin State Prison. His 26-year-old partner was found guilty of two counts of robbery, and acquitted on the other charges. He was sentenced to five years to life on each charge, to be served consecutively. He served seven years in San Quentin before he was paroled on Sept. 8, 1941. Leidy's widow never remarried. 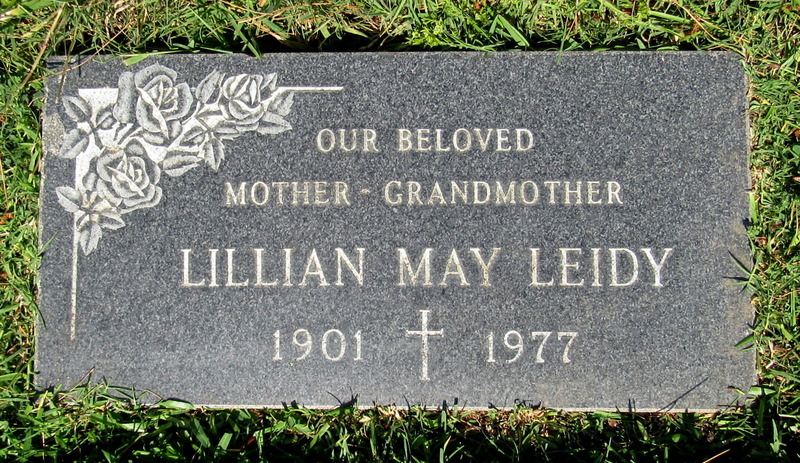 She died on Jan. 1, 1977, at the age of 75, in Inglewood, and is buried next to her husband at Inglewood Park Cemetery.